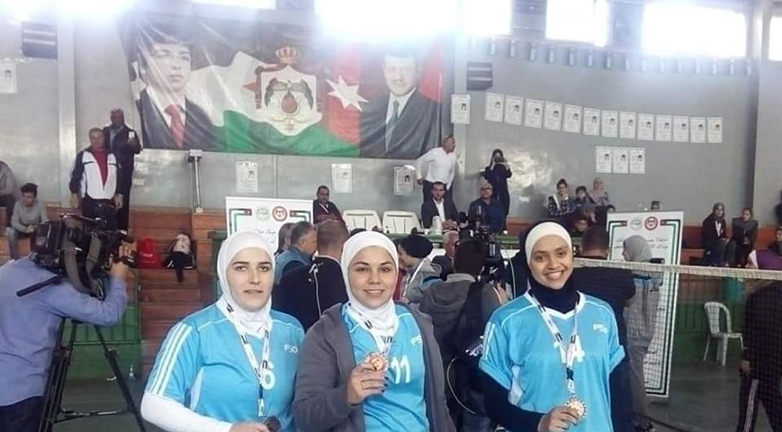 Zarqa University won the bronze medal in the badminton game held in Aqaba on the birthday of His Majesty King Abdullah II. Under the guidance of the university president, Prof. Dr. Bassam Al Helou, under the supervision and follow-up of the Dean of Student Affairs Dr. Majid Al Massadeh and the Head of the Sports Activity Division, Mr. Ezzat Al-Roud, the University team participated in the badminton game accompanied by Coach Bakr Al-Maghrabi and Sports Supervisor Inas Al-Mallah in which 18 public and private universities participated. Zarqa team showed up and won the bronze medal in the tournament with an outstanding level, which would not have been possible without their determination and their desire to win. The winning team included Rasha Al-Kotab, Afra Al-Rawi and Laila Alshishani. Rasha Al-Qotb won the bronze medal in the individual tournament in light of strong competition between the universities.